As their vehicles increase in popularity, electric vehicle owners are finding more and more charging stations to “amp up” their cars—including the Buffalo Bill Center of the West. The Center now hosts an electric car charging station, installed, appropriately enough, in time for April’s 2018 Earth Day. The Buffalo Bill Center of the West’s new electric vehicle charging station. Installed by Wild West EV, the charging station is capable of the fastest level 2 AC charging specification of 80 AMPs. It can be used on any of the latest electric car models on the market. Depending on the type of vehicle, the charging speed can very. For instance, drivers can expect to add fifty to sixty miles of range per hour on a Tesla with a dual or high amperage onboard charger. The system also works on the BMW i3 and i8, Chevy Bolt, Nissan Leaf, and with plug-in hybrids like the Prius Prime or Chevy Volt. With the J1772 industry standard plug, they are very safe to use in all weather conditions. The high power is only sent after payment by credit or debit card, and the car is safely connected. Then the vehicle and the charger conduct quick automatic safety checks before supplying the high volt and amperage to start charging the car. The vehicle will take as much power as the onboard AC to DC charger can handle. In the company’s testing with a 2012 Chevy Volt, the vehicle only used 14 amps of the 80 amps available. 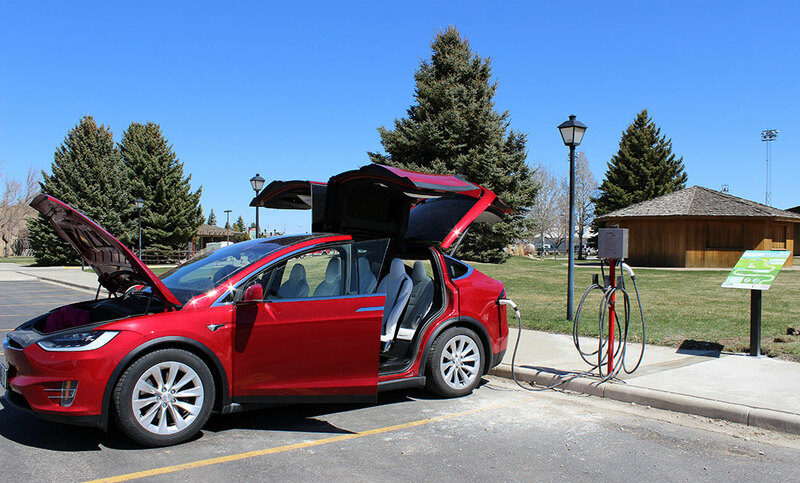 As the network grows, Wild West EV notes that they’re looking to place stations an appropriate distance apart, allowing electric cars to cruise anywhere in Wyoming. At no cost to the business, Wild West EV pays for the installation and electricity. For a map of all the electric vehicle charging stations in Wyoming, visit Wyoming Department of Transportation’s interactive highway map at map.wyoroad.info/wtimap/index.html. To see a video of the Center’s charging station in operation, see centerofthewest.org/event/earth-day. Contact: Phil Anthony, Operating Engineer, at [email protected] or 307-578-4118.